Chief Michael Maloney grew up in North Hampton, New Hampshire, and graduated from Winnacunnet High School. He served his country as a member of the US Army Reserves. He started his 26-year career in law enforcement as a part-time officer in Rye, New Hampshire. He joined the North Hampton Police Department as a full-time officer and, after working his way through the ranks, was promoted to Chief of Police in 1997. In 2000, Maloney became the Chief of the Greenland Police Department, where he served until his death in 2012. Chief Maloney was a graduate of the 76th Police Academy and had a Bachelor’s degree in Criminal Justice from Hesser College. On April 12, 2012, Chief Maloney was asked by the NH Attorney General’s Drug Task Force (DTF) to assist with the execution of a search warrant at 517 Post Road in Greenland. Chief Maloney, along with eight other Greenland and DTF officers, responded to the house. After failed attempts by Greenland officers to have the occupants answer the door, forced entry was made. The six DTF officers were met with gunfire and four sustained gunshot wounds. As the officers retreated from the front porch, Chief Maloney pulled a critically wounded officer out of the line of fire, into a Greenland officer’s patrol car, and had him taken to the hospital. Chief Maloney then returned to the gun battle to defend the other officers, and was fatally wounded. Chief Maloney was posthumously awarded the NH Police Chiefs’ Association Medal of Honor for his heroic actions. 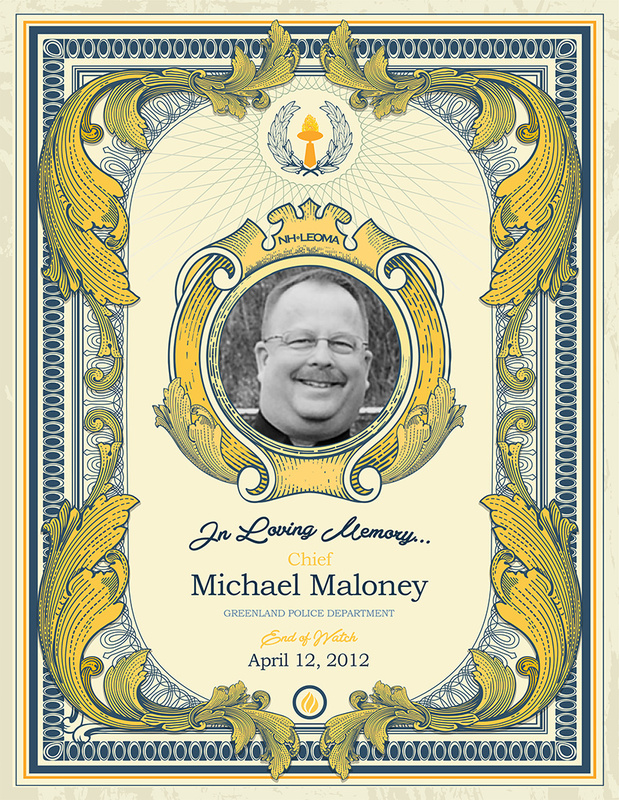 Chief Maloney is survived by his wife, Peg Maloney, children Michael Maloney Jr. and Serena Nieves, grandson MJ Maloney, step-son Ryan Vickers, father John Maloney, mother Joan Buchanan, brothers Tim Maloney, Dennis Maloney and Kevin Maloney, and sisters Kathleen Lahey and Carolyn Maloney.